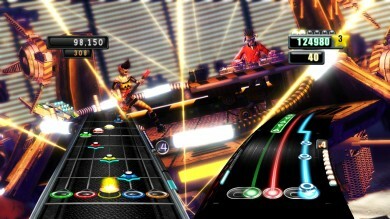 Co-Optimus - News - Coming Soon: DJ Hero 2 and... Guitar Hero Megadeth? Coming Soon: DJ Hero 2 and... Guitar Hero Megadeth? Things on the music game front have been surprisingly quiet. We know that Harmonix is working on Green Day: Rock Band, that much is certain. But that's pretty much it. Pretty odd when you consider how many upcoming music games we already knew about this time last year. (Could it be that we've reached the point of saturation? We have some thoughts on this we'll share with you soon.) Rumors about two more music games are swirling; one of them is confirmed, while the other isn't as substantial. First off, it seems that low sales of DJ Hero aren't keeping Activision from releasing a sequel later this year. Demonic CEO Bobby Kotick confirmed that an "innovative" and "better" DJ Hero will be in on store shelves before the year is out. May we humbly suggest improved co-op? The second rumor comes from Megadeth's Dave Mustaine. Apparently, Activision and the metal band have been talking. According to Mustaine, the game will not be a mere "box set" (like Guitar Hero Metallica, we presume) and will be "over the moon". That's about as clear as mud, but if it means playing more Megadeth in video game form, we're certainly interested. Did Inadequate Co-Op Play Doom DJ Hero to Low Sales? Page created in 0.3398 seconds.